← Kathmandu’s Durbar Square After the 2015 Earthquakes – Is It Worth 1000 NRP? This upload is mostly an expansion of the map section from my introductory post on Trekking Bolivia’s Cordillera Real – Maps, Basic Info, and Planning Advice. 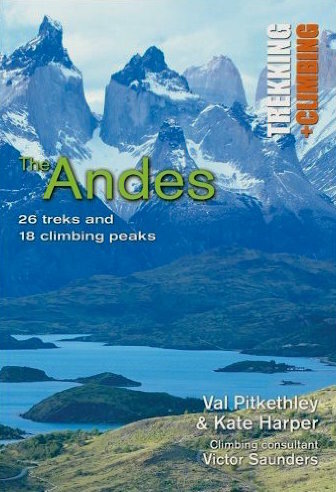 It only deals with the maps available for trekkers keen on an independent walk down the Cordillera Real from Sorata to Huayna Potosi and beyond. See the intro post for more on the best time to go, reputable trekking/climbing agencies, and acclimatization suggestions. Yossi Brain, whose climbing guide to Bolivian peaks (Bolivia: A Climbing Guide, 1999) remains a useful source twenty years after publication, also did a trekking guidebook. 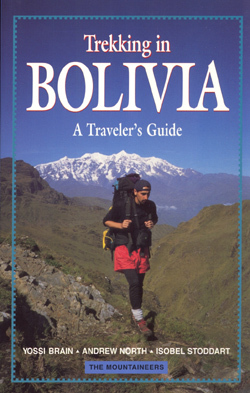 Trekking In Bolivia: A Traveler’s Guide, released in 1997, was perhaps the first book in English to provide a comprehensive introduction to Bolivia’s trekking possibilities. With Brain, as well as Andrew North, and Isobel Stoddart as the authors, it was published by The Mountaineers. The route that they describe is what I will call the “classic” one. It begins in Sorata at the north end of the Cordillera Real and then heads to the east side of the mountain range for seven or eight days before cutting across to the west side near Condoriri and then continuing on down to Botijlaca on the north side of Huayna Potosi. Most trekking agencies in La Paz still offer this trek – or sections of it – to prospective trekkers. Here is the map from The Andes: 28 Treks… It starts in Sorata unlike the one above. Wikiloc, a route-sharing app, has a couple of versions of the classic route available. Click on the map image to access the one uploaded by isards de la Cerdanya in April 2011. Click on the map image to access the Wikiloc site – or click here. A more recent Wikiloc upload of the same classic route as done by Moebius1 in July 2014 and can be accessed here. I used the Wikiloc app for three weeks of hiking in the Bariloche area and found it to be a worthwhile investment. See here for more info on ios or android versions. Given increased mining activity in the Sorata area, as well as on the east side of the Cordillera, the Andean Summits team, as well as others, have developed an alternative route that stays on the west side of the Cordillera until the last full day of the trek. Instead of the traditional first eight days of the classic route which goes north and east from Sorata, this one heads southeast from Sorata to Millipaya and Alto Llojena and then on to Lago San Francisco. Doing so, it avoids the mining roads and the potential for trouble in the sometimes boisterous mining communities on the east side. Here is the track created by my Spot Connect with its once-every-ten-minutes location when it was working as it should. 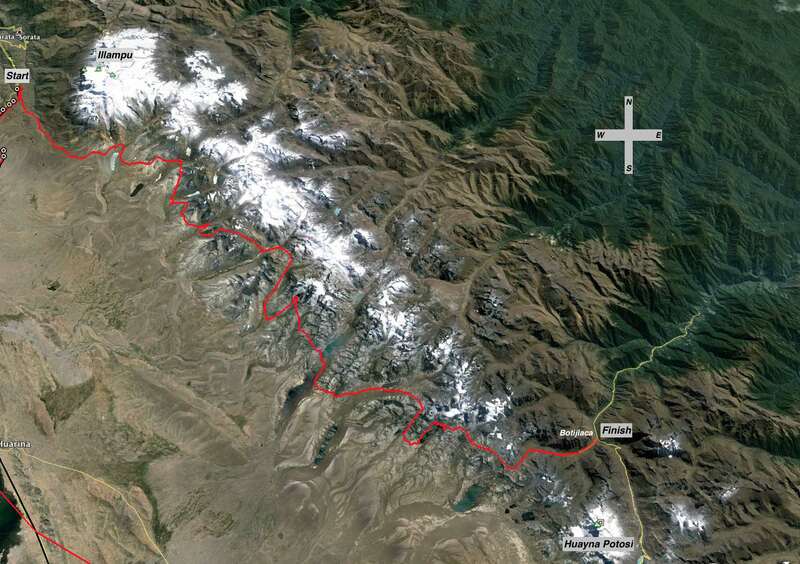 It recorded 449 individual GPS waypoints during the two-week trek. On occasion (see the map below) it missed recording a location for an hour or more so it is less than perfect! If you have a better track and would not mind sharing, please email me! I’d be happy to post a link to it here for the benefit of future trekkers keen on experiencing what you and I did! The kml file will open in Google Earth and will provide incredible 3D views of the terrain you will be traversing; I opened the GPS file in my GPX Viewer app (available in both ios and android versions). The two images above are from the app, which I set in Outdoors view. I found a copy of the Liam O’Brien map in a La Paz bookstore called The Spitting Llamaat Linares 947. 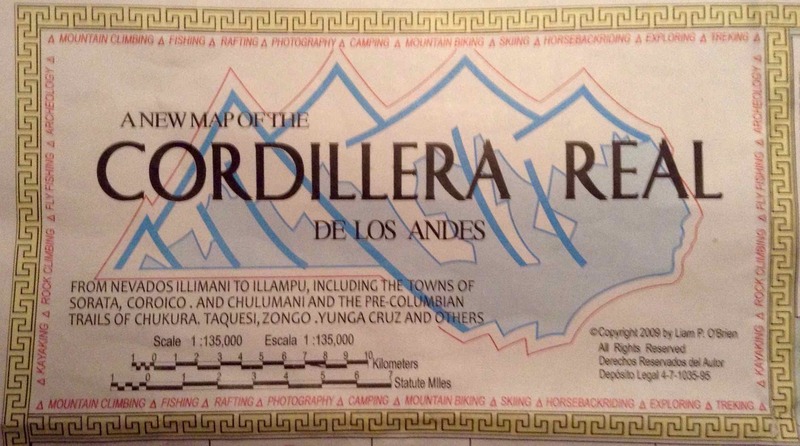 Titled A New Map of The Cordillera Real De Los Andes, the map is a 2009 reprint of the original from 1995. The scale is 1:135,000. It is unclear if any changes were made in the reprint; the glacier limits shown on the map are based on Landsat images from 1989 and 1992 and are thus about twenty-five years old. You can purchase the above maps at $20. U.S. a sheet from Omnimap.com, a North Carolina, U.S.A. business that has been selling maps since 1982. Or – you can do what I did and download them from the University of Texas’ online map library and print off the parts you need yourself or just upload them to your iPad for paper-free use. 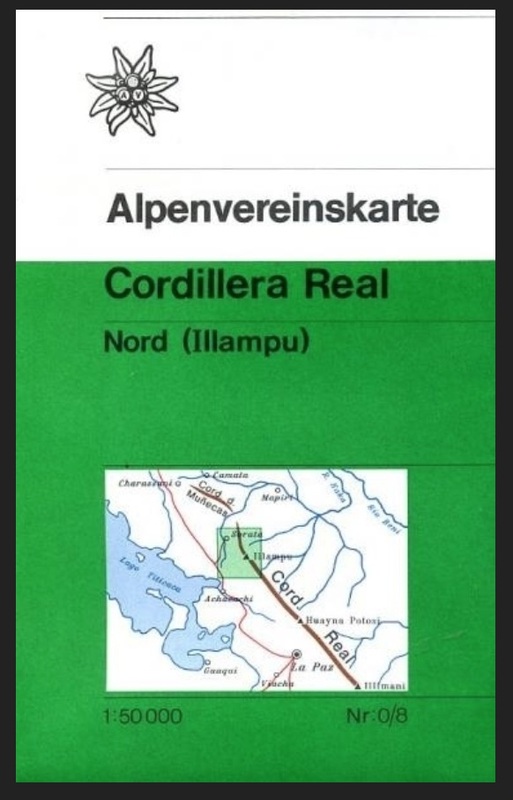 One more map possibility: There is a 1:50,000 German Alpine Club map – click on the title for the information – TREKKING MAP – CORDILLERA REAL NORTH / ILLAMPU (BOLIVIA) | ALPENVEREIN. It covers a small area, as the image below shows. It may be more appropriate for those planning a summit of Illampu than for those planning a 120-km walk down the cordillera’s east or west flank. There is a second map which covers the area of the Cordillera around Illimani. The two maps were published in 1987 and would be the oldest of all the maps mentioned here. My series of posts on each day of our trek also has maps, elevation charts, satellite images, and photos which would be of help in finding your way down the Cordillera without too much drama! We began our trek, not in Sorata (2700 m) but off the highway (3900 m) about fifteen kilometers south of the town. Starting from Sorata would add an extra day to the trek. This entry was posted in Bolivia, hiking/trekking, mountaineering and tagged Cordillera Real classic route, Cordillera Real gps, Cordillera real kml, Cordillera Real maps, Cordillera Real route, Cordillera real topo map, Cordillera Real trip report, Cordillera real west side, Trans-Cordillera trek. Bookmark the permalink.